Great Performances: The Opera House, the new documentary by multiple Emmy Award-winning documentary filmmaker Susan Froemke (Grey Gardens; Lalee’s Kin: The Legacy of Cotton) surveys a remarkable period of the Metropolitan Opera’s rich history and a time of great change for New York City. Drawing on rarely seen archival footage, stills and recent interviews, the film chronicles the creation of the Met’s storied Lincoln Center home of the last 50 years, set against a backdrop of the artists, architects and politicians who shaped the cultural life of New York City in the 1950s and 60s. Amongst the notable figures featured in the film are famed soprano Leontyne Price, who opened the Met’s present Opera House in 1966 with a starring role in Samuel Barber’s Antony and Cleopatra; Rudolf Bing, the Met’s imperious general manager who engineered the move from the old house to the new one; Robert Moses, the unstoppable city planner who bulldozed an entire neighborhood to make room for Lincoln Center; and Wallace K. Harrison, whose quest for architectural glory was never fully realized. 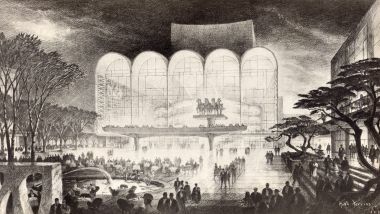 The Metropolitan Opera began planning for a new home in the mid-1950s to provide the company with a cutting-edge, modern theater to complement the golden era of its storied history. The perfect political and cultural storm allowed for the construction of the Opera House. City planner Robert Moses cleared the way by removing the slums of the Upper West Side; John D. Rockefeller III had the money to make his vision of the first modern American cultural campus a reality; and architectural talent Wallace K. Harrison (Rockefeller Center, United Nations) was commissioned for the project. The Metropolitan Opera House at Lincoln Center opened in 1966 with Samuel Barber’s Antony and Cleopatra, featuring famed American soprano Leontyne Price. The A-list audience included First Lady of the United States Lady Bird Johnson and her guests Ferdinand and Imelda Marcos, as well as leading statesmen: the Vanderbilts, the Whitneys and the Astors. Great Performances: The Opera House is directed and produced by Susan Froemke. Peter R. Livingston Jr. is editor and co-director. Peter Gelb is producer. For Great Performances, Bill O’Donnell is series producer and David Horn is executive producer. Major funding for The Opera House was provided by the Lloyd E. Rigler-Lawrence E. Deutsch Foundation. Great Performances is funded by The Joseph & Robert Cornell Memorial Foundation, the Anna-Maria and Stephen Kellen Arts Fund, the Irene Diamond Fund, The LuEsther T. Mertz Charitable Trust, The Agnes Varis Trust, The Starr Foundation, the Kate W. Cassidy Foundation, Ellen and James S. Marcus, the Philip and Janice Levin Foundation, the Thea Petschek Iervolino Foundation, The Abra Prentice Foundation, Rosalind P. Walter and PBS. Now in its twelfth season on PBS (check local listings), Great Performances at The Met presents nine Metropolitan Opera productions featuring the world’s leading stars. Upcoming broadcasts include Donizetti’s L’Elisir d’Amore (April 29), Puccini’s La Bohème (May 20) and Tosca (June 15), Rossini’s Semiramide (July 8), Mozart’s Così fan tutte (July 29), Verdi’s Luisa Miller (August 12), and Massenet’s Cendrillon (Sept 9).